While editing and compiling a video such as this, I don’t actually ‘see’ whats going on until its finished. So, in a way, watching the finished video, ‘speeded-up’, is an education for me because while the overall painting is being considered the actual small steps are almost automatic. It is in the planning of the painting where this is most apparent, especially in the construction lines in the sky. I wanted to have a particular lighting effect caused by moonlight, but subconsciously the sky needed perspective and distance at the horizon. Its because the sky occupies such a large part of the painting (about 2 thirds of the area) that this is important here. So while I was preoccupied with sky colours, and how they could exaggerate the moon light, I placed 2 ‘ribbons’ of shapes running from above the head of the viewer to the distant horizon as a frame on which the clouds would hang. It helps to ‘map out’ something, especially when confronted with such a large blank area to be covered. The end justifies the means might explain some of the peculiar early stages in a painting. Even at the end there are unusual twists and turns and so it was with the area around the moon. To me, at the end of the painting, it seemed too organised and contrived. So the area was ‘mashed up’ with daubs of thick paint to remove this regularity. When I read in Alissa’s Blog, “When Wrong Is Right”, – ‘these mistakes are exactly what makes a work true for the artist’, I was reminded of this. 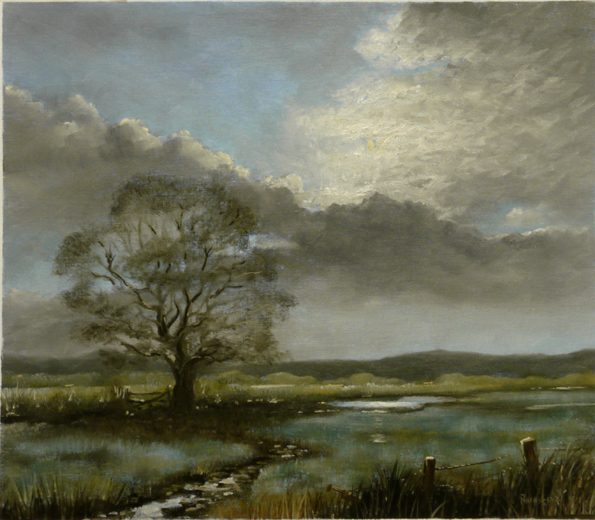 This entry was posted in Oil Painting and tagged Art, Culture, Education, Inspiration, Oil Painting Instruction, Oil Painting Landscape, Painting Moonlight, Time lapse painting. Bookmark the permalink.